This garden fresh panzanella salad is a great way to enjoy your summer harvest of homegrown vegetables. 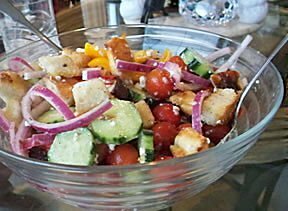 The addition of feta cheese and kalamata olives gives this panzanella salad a Greek flair. Panzanella can be served as a side dish but it is also perfect to serve as a light lunch or supper. See how easy it is to remove the seeds from a watermelon by making just the right cuts. You can use one of several methods for cooking sweet corn. Search through the different options to find one that is perfect for your needs.